Business process re-engineering is a business management strategy, focusing on the analysis and design of workflows and business processes within an organization. BPR aimed to help organizations fundamentally rethink how they do their work in order to dramatically improve customer service, cut operational costs, and become world-class competitors. BPR seeks to help companies radically restructure their organizations by focusing on the ground-up design of their business processes. Business process is a set of logically related tasks performed to achieve a defined business outcome. Re-engineering emphasized a holistic focus on business objectives and how processes related to them, encouraging full-scale recreation of processes rather than iterative optimization of sub-processes. This sample was created in ConceptDraw DIAGRAM diagramming and vector drawing software using the Business Process Diagram Solution from the Business Processes area of ConceptDraw Solution Park. The Business Process Solution is based on the standard BPMN 2.0 and includes the set of libraries of ready-to-use objects. This sample shows the diagram of Business Process Reengineering Cycle. The Business Process Reengineering (BPR) is a strategy of business management that helps companies restructure their organizations. Reengineering focuses on the design and analysis of business processes. Reengineering also redesigns the business processes to achieve the improvements in the critical performance measures of organization. Using the libraries of the Business Process Diagram Solution for ConceptDraw DIAGRAM you can create your own professional Business Process Diagrams quick and easy. The Business Process Diagrams produced with ConceptDraw DIAGRAM are vector graphic documents and are available for reviewing, modifying, and converting to a variety of formats (image, HTML, PDF file, MS PowerPoint Presentation, Adobe Flash or MS Visio). This sample shows the Business Process Reengineering Diagram. Reengineering is the process of the business processes optimizations. This sample can be used in business process management, quality management, project management and program management. 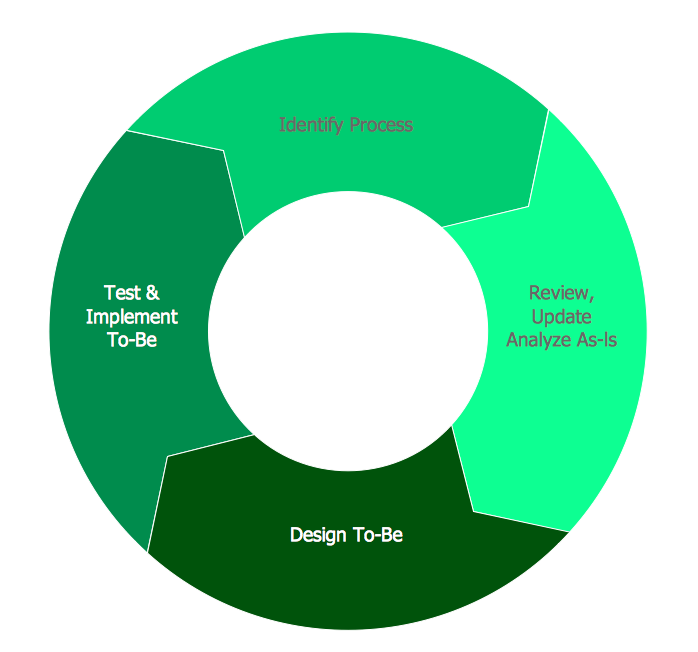 This sample shows the Business Process Reengineering Diagram, displays the Continuous Improvement Process (CIP) directed at the permanent improvement of the processes. This sample can be used in business process management, quality management, project management and program management. Workflow Diagram created by using special software based on graphic mastering technology Arrows10. Its automatics follows the global concept of business graphics and diagramming. The practical effectiveness of Arrows10 technology used in ConceptDraw DIAGRAM v12 are around the quick auto-arrows behaving as expected and connecting boxes of workflow diagram from workflow symbol to process flow symbol. ConceptDraw DIAGRAM v12 is a workflow diagram software contains specific features help you to draw diagrams faster, such as RapidDraw, or Arrows10. There is also a rich set of samples and templates to give you an example of data may be visualized as workflow diagram.